Nissan will price Cube at $14,685 in U.S. The Cube will launch in Europe in November. CHICAGO -- Nissan's tall, boxy Cube will carry a $14,685 base price when sales begin in the U.S. in early May. “The car has a small footprint, but a big interior. It is functional and fashionable at the same time,” said Rich Latek, Nissan's director of small car marketing, during a press event Tuesday night tied to the Chicago auto show. The base price includes destination charges. The Cube will be positioned above the Nissan Versa and below the Nissan Sentra. The Cube shares a front-drive platform with the Versa. 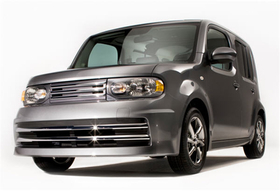 The car is aimed at Honda Fit and Scion xB and xD shoppers. Latek said that next week Nissan will launch a Web page called “Reserve Your Cube” for interested shoppers. “Those first in line will have an opportunity to spec-out a Cube, and get it as quickly, as easily and as hassle-free as possible,” he said. Nissan will launch sales of the Cube in Europe in November. The carmaker has not announced European prices. Nissan will stress personalization, offering over 40 accessories such as aero kits and a 20-color interior illumination package. Nissan's recently created Specialty Vehicle Group will create two limited edition models, marketed under the Krom and Nizmo names. Nizmo is Nissan's performance brand. Steiner said the Krom edition will be a little sportier while Nizmo will stress performance. The base Cube will be equipped with a 122-hp 1.8-liter four-cylinder engine and a six-speed manual transmission. A continuously variable transmission is optional.